Few things beat a Brooklyn Cyclones game on a fair June night, as far as untarnished New York summer joys go. I look forward to my first game of the season every year. You mean the Bloomberg administration and Thor Equities put back all they've destroyed over the past five years? I'm trying to guess if the salty figures who frequent Eastside Billiards in Yorkville (I see them grabbing smokes on the second-floor balcony) are psyched or embarrassed that Victoria's Secret is moving in downstairs. 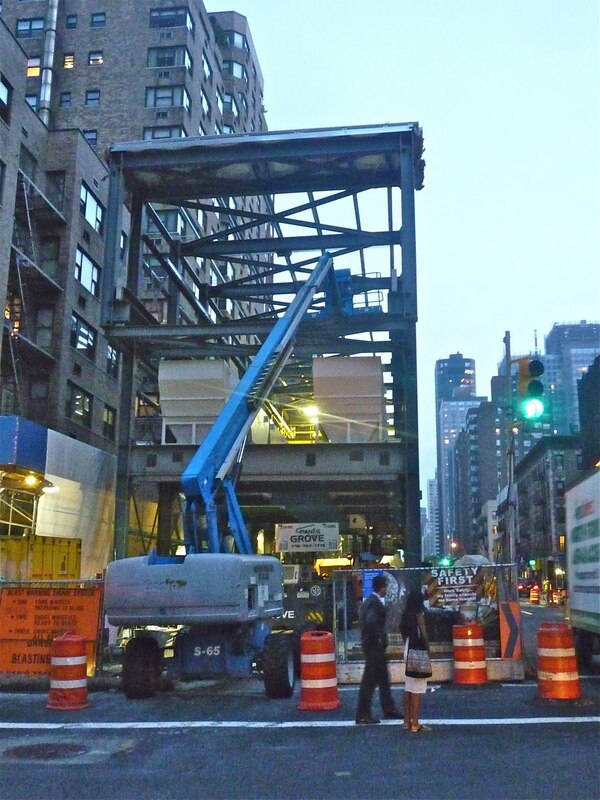 Who needs to see "Transformers 3" when you can go up to upper Second Avenue and look at the mind-blowing mechanisms that are busy digging New York's latest hole in the ground. I have no mental grip as to the hows and whats of creating a subway tunnel. So when I took these photos, I had no conception what I was looking at. All I know is they set up sent my eyes a-spinning. Two-story-high scaffolding! Super cranes in big, bigger and biggest sizes! Big white containers that contains who knows what! And—my favorite—two-story blue metal containers that act as offices for all the subway muckamucks. (Last picture below.) Holy crap. Subway-making is serious business. Upon a recent trip to the top of the 1 line in the Bronx, I was impressed by this elevated station at 231st Street and Broadway. The station was built in 1907 as part of the old IRT, and was renovated in 2003. But there was some quality material to rehabilitate there. I sort of blame "Ghostbusters" for giving everyone the idea that living in a firehouse would be kinda cool. I can't blame people for thinking it. I bet it is cool to live in a firehouse. I put it but behind living in a former synagogue on the coolness scale. There are a few richies in my neighborhood alone who have bought up engine houses as the City closes them down, and now dwell inside in eccentric luxury. Here's one on W. 30th that's for lease. It was erected (by the New York Board of Fire Underwriters!) in 1894. A survivor in The Chelsea Hotel. Look the hand-painted illustration of the paella. Nice awning, too. How long until the bone-headed owned of the landmark hotel kick the restaurant out in favor of a Ponderosa? 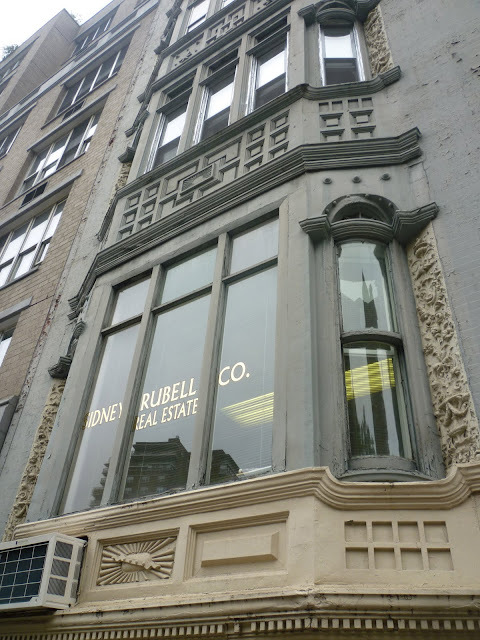 The Chelsea real estate firm of Sidney Rubell is situated in a remarkably handsome building on W. 23rd Street. The bay windows on 348 W 23rd Street go all the way up to the third floor and each floor is separated by a carved wood panel that runs nearly the length of the building. This is the eleventh post of "The Union Street Project," in which I unearth the history of every building along the once bustling Brooklyn commercial strips of Union Street between Hicks and Van Brunt, and Columbia Street between Sackett and Carroll. I always thought 142 Union Street was a fairly recent addition to the block. The squat, two-story, red-brick, faux castle just didn't have the look of antiquity about it. Perhaps it was an unfortunate creation of the 1970s. Not so. The below 1920s photo shows the structure had the same silly, grandiose look back then. In fact, the facade is remarkably untouched! On the Upper East Side. 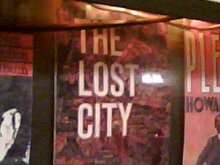 Lost City Asks "Who Goes to Liebman's Kosher Deli"? This is my second "Who Goes There?" column to penetrate The Bronx. Always eat well up there. Gotta go more often. There aren't many echt Jewish delis left in increasingly suburban-seeming New York City. 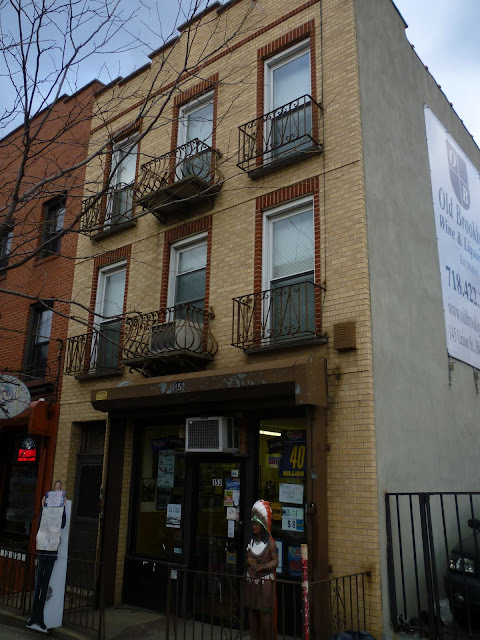 However, the isolated, strangely bucolic neighborhood of Riverdale in the northwest corner of The Bronx enjoys the wares of three of them, owing to the still-strong Jewish community here. The oldest is Liebman's Deli, born in 1958 and still run by the same family (name of Dekel, not Liebman) that has owned it for thirty years, operating out of a narrow space in the middle of Riverdale's old downtown. The business has largely endured thanks to the allegiance of locals. The people who eat there aren't exactly spring chickens. And they've probably enjoyed Liebman's delicious, but highly caloric, chow many times. (More than a few of the hefty guests had trouble hoisting themselves out of the green-hued booths.) But Liebman's also still gets faithful car traffic from people who used to live in the area and still crave the pastrami, which is made and sliced on the premises. 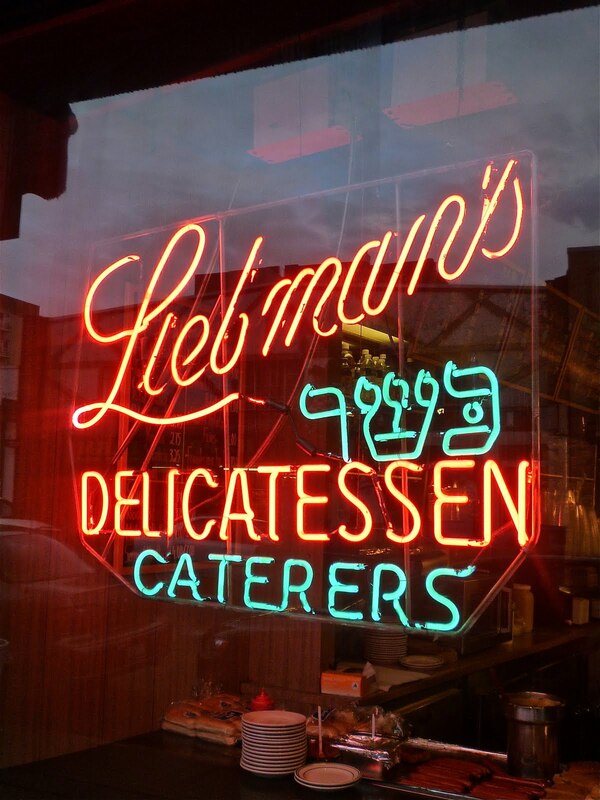 Liebman's is also one of the last Jewish delis in town to make round knishes, a knish shape on its way out. There are a lot of reasons to like Liebman's beyond the food, which is wonderful; I love the Liebman's Favorite, which packs corned beef, pastrami, kishka and perhaps the best french fries in New York, along with gravy, onto one plate. For one, the prices are not at Manhattan levels. The above dish, for instance, costs all of $15; most sandwiches are under $10. And the help is helpful, not Carnegie Deli gruff. 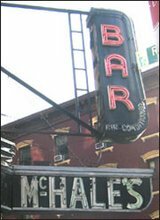 Furthermore, the atmosphere is calm and quiet, which can be a nice change after the rattle and hum of most New York eateries. For those concerned about such things, Liebman's is open on the Jewish sabbath, and therefore not strictly kosher, its name notwithstanding. For areligious foodies, though, that just means more opportunities to nosh. I biked, and then walked (Dismount bikes here! ), through the Pier 1 extension of Brooklyn Bridge Park the other day. Very nice. Very green. And I appreciated the noted used of native plants. 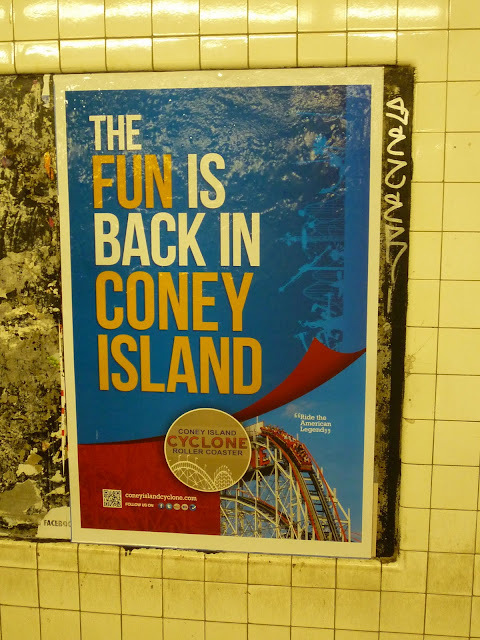 And that New Yorkers now have another way of getting very close to the water, and that Brooklynites can closely feel their relationship to Manhattan (There it is!). I also appreciate the wine bar. When Casa di Campagna, the new Italian restaurant on Columbia and Kane Streets in Brooklyn, started setting up for business, its look was clean and dramatic, if oddly north-woodsy. I kind of like the odd log cabin feel. Since then, however, the owners have added more and more layers of stuff to the facade, at the rate of about one new thingee a week. The place is started to look like a gas station offering a desperate sale on tires. 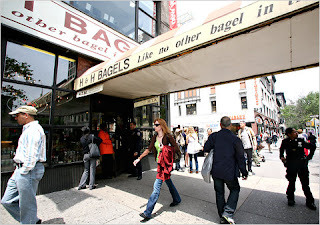 The shop, a landmark to bagel-loving New Yorkers for 40 years, was the victim of mischief and mishandling on the part of the owner, Helmer Toro. In late 2009, Toro was accused of absconding with almost $370,000 in payroll withholding taxes owed to state and federal authorities from 2003 to 2009. In May 2010, he pleaded guilty to grand larceny in the case, wrote the Times. He was sentence to spend 50 weekends in jail and pay more than $500,000 in restitution. The factory and shop at 639 West 46th Street will remain open, but who really cares. The real New York experience was visiting the curious, bare, but fancy (chandeliers?) shop at the corner of W. 80th. The bagels were so popular that they sold fast; hence, they were always fresh, and often warm. They were the big, soft sort of modern bagel of which I don't necessarily approve. And the blueberry bagels are just nonsense. But of their type they were excellent. I've said before that whatever thin veneer of authenticity and integrity the Upper West Side still clings to depends on just a handful of places, among them Zabar's, Citarella and Murray's Sturgeon Shop. It's just lost a mighty pillar. I was browsing through an old magazine when I found this 1919 ad for the I. Miller shoe store in Times Square. 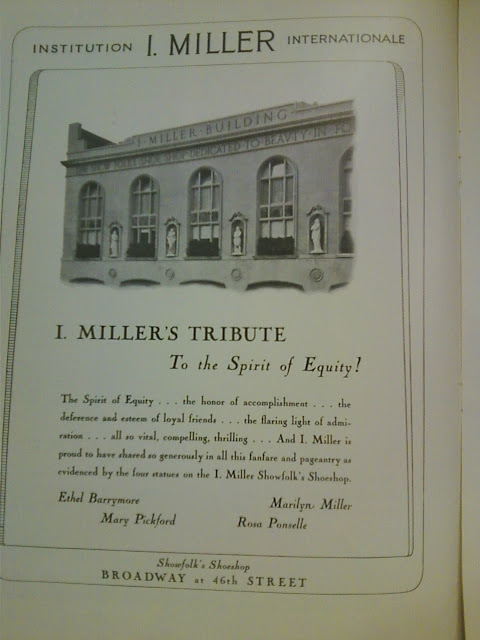 The Miller building, which still exists, is familiar to all New York history buffs, owing to its one-of-a-kind statues along the south face, depicting Ethel Barrymore, Marilyn Miller, Mary Pickford and Rosa Ponselle, representing the arts of theatre, song, film and opera; and for its timeless motto, "The Show Folks Shoe Shop Dedicated to Beauty in Footwear." It's been laboring as a garish TGI Friday's for some time, and the south facade has long been grimy and in need of a refurbishment. But this ad shows how clean and beautiful it once was: the statues white and free of bird dropping' and the windows—not cut in half by a TGIF floor plan—allowed to soar. We can also see that the wire cages on the second floor windows once held hedges. Many has been the time when, approaching the cashier as some nondescript deli, my eye has been caught by a display of pre-packaged Voilà Croissants. The sight has always amused and appalled me. In a city like New York, where wonderful bakeries are everywhere, who would satisfy their croissant needs in this processed way? And the name—Voilà—in letters the colors of the French flag. Could the packaging be any more cheesy? During a trip to Bushwick recently, I passed by the Voilà factory by accident. Curious about the company, I consulted their website when I got home. Turns out they make much more than croissants, including muffins, rolls, pastries and frozen dough for just about everything. But here's the real shocker. The company was founded in 1976 was a veteran of the tony La Grenouille Restaurant, which is still the standard bearer for fine French cuisine in New York. Founder Frank Kitchens says he was the pastry chef there. He created Voilà to satisfy "the need for better quality fresh baked products." Is this true? I don't know. I can find no other information about Kitchens outside the Voilà site. But it would be ironic and funny if it were. This is the tenth post of "The Union Street Project," in which I unearth the history of every building along the once bustling Brooklyn commercial strips of Union Street between Hicks and Van Brunt, and Columbia Street between Sackett and Carroll. 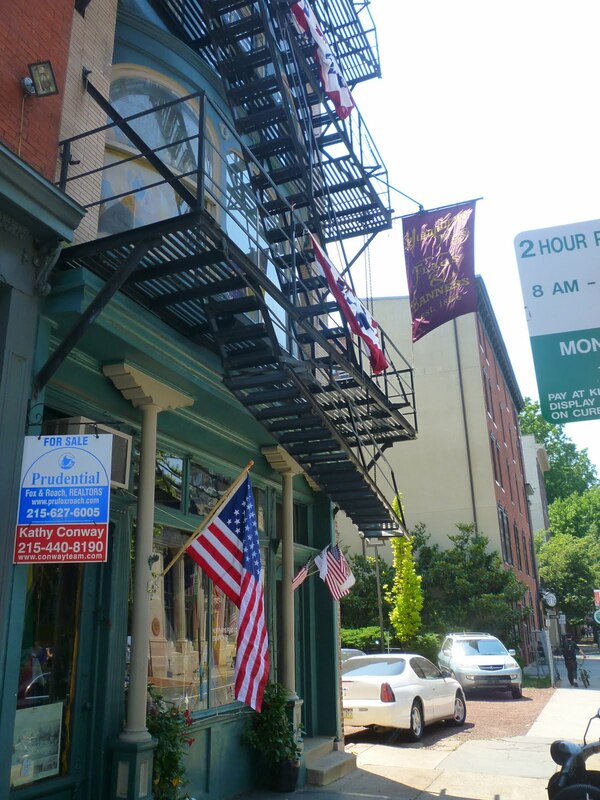 153 Union, the building that forms the eastern wall of the northern side of the block between Columbia and Hicks Street, is the structure just to the right of the famed Ferdinando's Focacceria. For at least a couple decades, it has been the bare-bones, deli and cigar store known as Sonny and Nancy's. They advertise themselves as the home of four lottery winners, and have done so for ten years or so. Which means no one has scored since 2000. Sonny died a few years back; Nancy runs the store now. It's a nice place, though I find it curious that Nancy knows nothing about the cigars she sells. Old-time locals congregate here, and a newbie can be given the fisheye. There are framed photos of old-time Union and Columbia Streets on the walls. I have been told anecdotal stories that the shop used to be a toy store before Sonny and Nancy came along. But before that it was certainly the Union Center Meat Market. You can see the building in the 1920s below. It's the shop to the left. As the photograph illustrates, the wirework around the windows today is original, though the fanciful brickwork has been simplified over time. I've learned nothing else about this butcher. But then, butchers rarely make the news. An added bonus to the archival photo above is that it features 155 Union Street, a building that has not existed for half a century. It was one of the many structures torn down on this side of Hicks to make way for the BQE. Today it's a vacant lot, but in years past, as we can see, it was a barbershop. Next to it was a garage. I thought New York had a store of every kind. But I'm not aware of one that makes and sells only flags. Philadelphia has Humphreys Flag Company. However, New York can enjoy a proprietary feeling toward the shop. It was founded in New York City in 1805 as a sail manufacturer. It moved to Phily in 1864, still making sails, but also flags. It now purports to be the leading business of its kind in the U.S. The shop's location is ludicrously ideal—right across the street from the Betsy Ross home. However, this has only been Humphreys' address for a few decades. The shop is owned by Tim O'Connor, who says he can make any flag that's requested. They're made to order. Fitz-Greene Hallack has a couple nasty little street names after him in New York. One is up in The Bronx, in the Hunt's Point area. It's about two blocks long. The other is also in an industrial area, Red Hook, Brooklyn. This one is a mere one block long. And you could barely call it a street. It's more like an access point for unloading trucks. Theses sad stretches of pavement are what's left to honor a man who was once New York's most famous and beloved poet. Hallack lived from 1790 to 1867. In is youthful years, he was widely read and called "the American Byron." He and his bosom friend Joseph Rodman Drake were both members of the Knickerbocker Group, which included such luminaries as William Cullen Bryant, James Fenimore Cooper and Washington Irving. Charles Dickens admired Halleck. Lincoln read his poems aloud. We, of course, still know and read these names. Yet Hallack's works are covered in dust, even though his most famous poem, "Fanny," (1819) was once so popular that 50-cent editions of it were hawked for ten bucks. I have read some of Halleck's poems. Sadly, they deserve their obscurity. They're sentimental and derivative. His best known poem today is perhaps the one he wrote in tribute to Drake, when the latter died at 25 of consumption. Halleck so lauds the man, you would think Keats had passed. Literary scholars today think Hallack was probably in love with Drake. It's hard to counter their claim. Hallack described his friend as "perhaps the handsomest man in New York—a face like an angel, a form like an Apollo." And, in his will, Halleck asked that Drake be dug up and reburied next to him. Remarkably, this was apparently done! To see what Halleck looked like, go to Central Park. There's a statue of him on the Literary Walk. It was erected a decade after his death. Today, his is one of the few statues on the walk to regularly bring head-scratches from the passing crowd. It was far from thus when President Rutherford B. Hayes dedicated the monument. An estimated crowd of 10,000 spectators attended, and so damaged to the surrounding turf that Park officials subsequently banned large crowds from the park. I made my first visit to the Red Hook Ballfield Vendors of the summer this past week. I'm a little tardy in getting to them this year, I admit. Got there early and had to wrangle with no lines. Had a chorizo huaraches from the Martinez stand (above). Also, tried something new from the Carello Guatemalan stand, which has slowly become my favorite of the stands over the years, for its variety of foods, cheap prices, cheerful service and the freshness and deliciousness of its products. It was a pacaya, a tropical forest palm found in Mexico. It's deep fried and served on a tortilla like a taco, with hot sauce and onions. It's wonderful, with a distinctly fibrous texture. Yonah Schimmel is the stuff of New York legend. The shop he started on the Lower East Side is probably the best known knishery in the United States. But, there was another Schimmel in the food-slinging business. I was recently contacted by the granddaughter of Leo Schimel (who spelled his name with one less "m"). Leo was Yonah's brother. Around the same time Yonah started his knishery, Leo opened a dairy restaurant in Jewish Williamsburg. It was called Sunset, or, possibly, Famous Sunset, and it was on Havemeyer Street. Maybe 203 Havemeyer Street. The granddaughter isn't sure. And Leo ran it in the early 1940s. I've done some digging, but come up with nothing about Leo Schimel, or a restaurant called Sunset in Williamsburg. I did learn, however, that 203 Havemeyer was indeed a restaurant of some kind in 1945. But that's as close as I came. Does anyone out there, by any chance, have any information about this lost link in the Schimmel/Schimel chain? Yonah Schimmel, for the record, is still in the family, but hasn't been run by a Schimmel in forever. 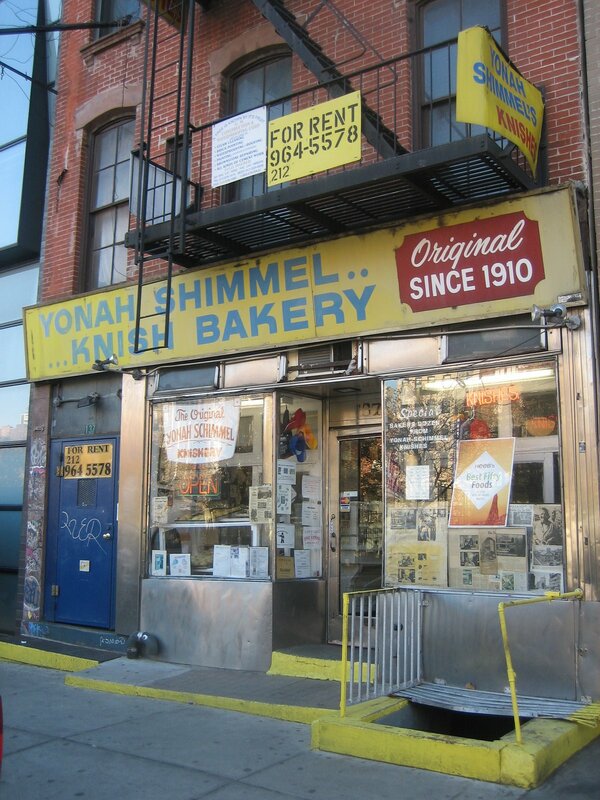 Schimmel began selling knishes from a cart in 1890. He opened the store with his cousin Joseph Berger, but left the business soon after. 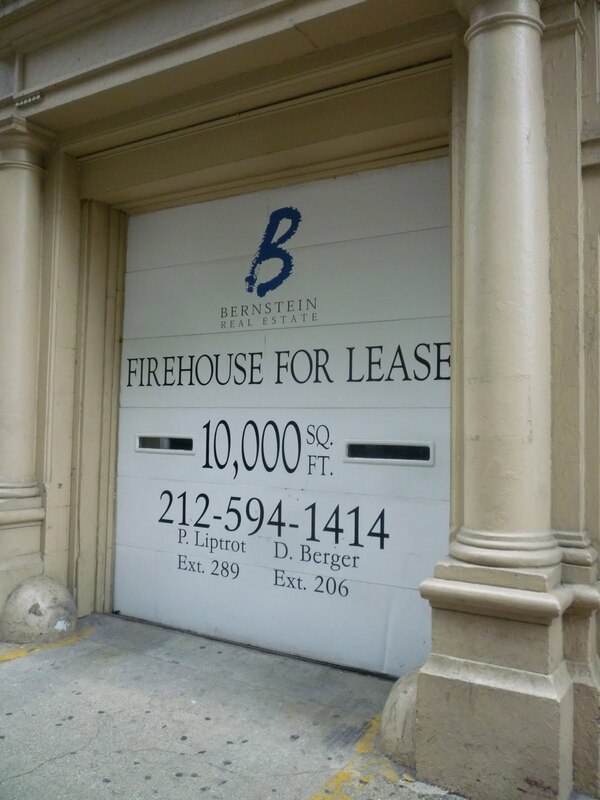 Berger continued to run it and moved to the current location on E. Houston Street. It's currently run by Yonah's great nephew, Alex Wolfman. The beautiful Art Deco building is on 2nd Street in the Old City section of Philadelphia. It's just down the block from Trenton China, which I posted about earlier. 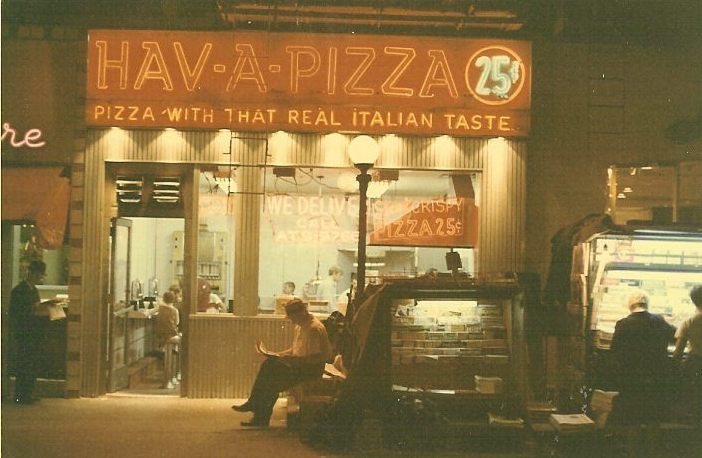 A reader then commented that the business was perhaps part of an area formerly called "Restaurant Supply Row." I have to think he's right. I don't think the building is still in use. It certainly wasn't open in the middle of a workday. As the sign (partly) shows, the business was founded in 1929. Love the lettering above and below the line. Just a quick update on the wooden phone booth at the Old Town Bar. Like many of the phone booths around town, it has recently been gutted and is now bereft of a phone. But, more than that, you can't even enter it. The bar owners have pushed a booth up against the folding doors. The Station Cafe in Woodside, Queens—one of the greatest, rottenest dive bars in the city—has a brand new awning. 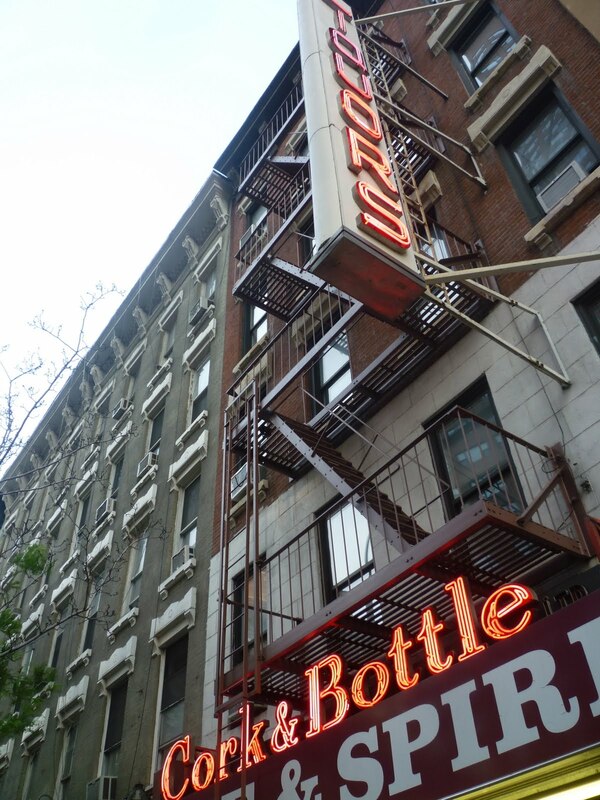 The former awning was faded, ripped, listing and brick red, like the bar's old metal facade. The new one is a stark black and white number. Not unhandsome in its way. Certainly not one of these faux-posh forest green numbers you see everywhere, thank God. But it certainly makes the Station seem less wondrously divey than it was. One other thing. The old awning said Station Cafe on the front. A strangely quaint name for the place. Which was why the name was so great. 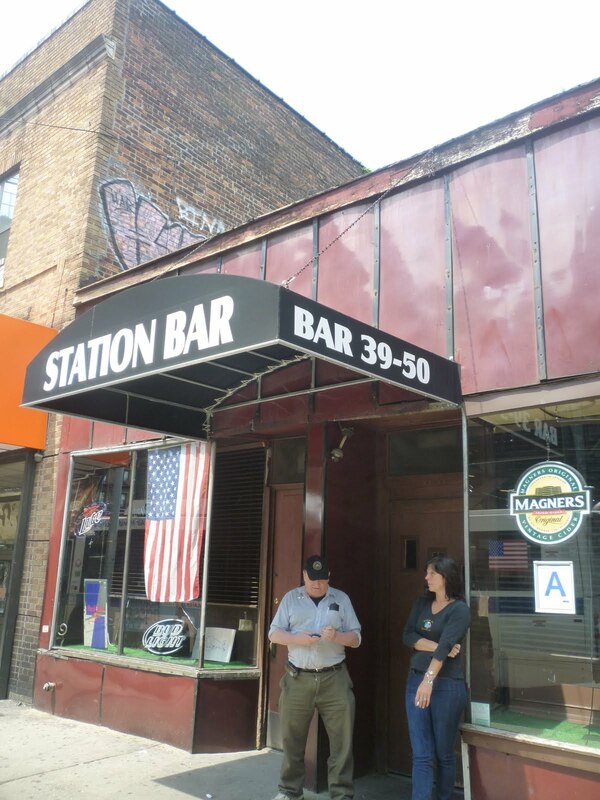 The new awning offers the more prosaic Station Bar. The old awning must have fallen down or something. I can't imagine the owners of the Station making the switch unless they were forced to. 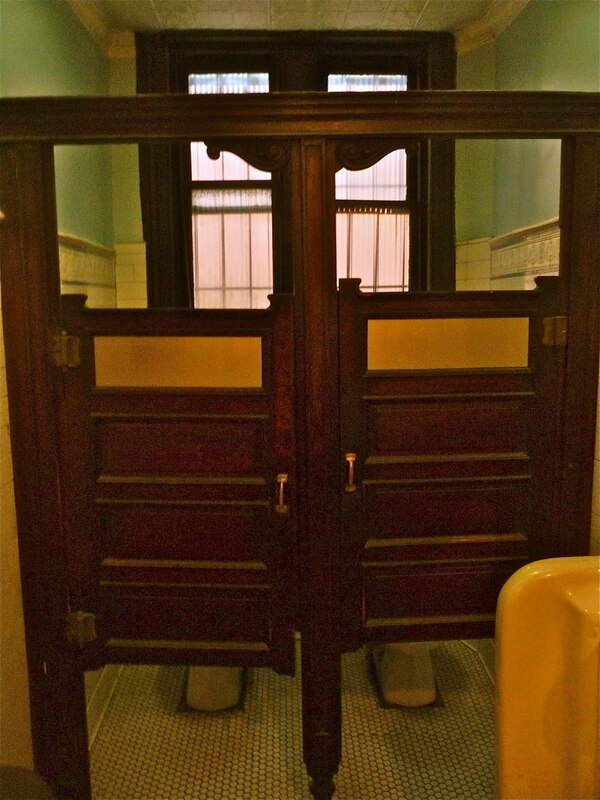 I've never before photographed the beautiful old men's bathroom at the Old Town Bar. (And, yes, judge me as you like, I've long wanted to photograph it.) This is because it is usually occupied, and propriety does not permit my taking photographs. 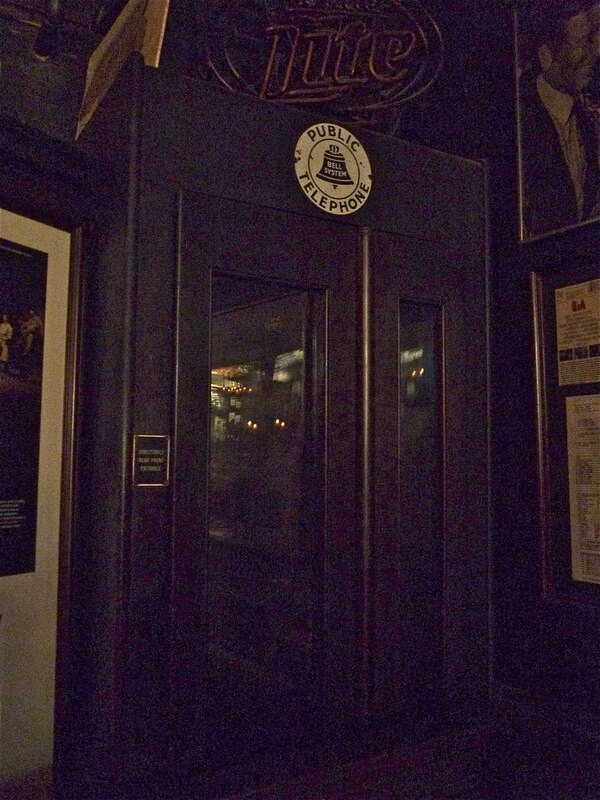 Also, it's often after hours when I visit the ancient Manhattan tavern, and the light is not ideal. However, recently, I happened to pay a call on the Old Town during daylight hours. The bar was sparsely populated, and I found the lavatory unvisited for many minutes at a time. Some old saloons in the city (P.J. Clarke's, McSorley's) still have their big, ceramic urinals. But the Old Town has the whole package. 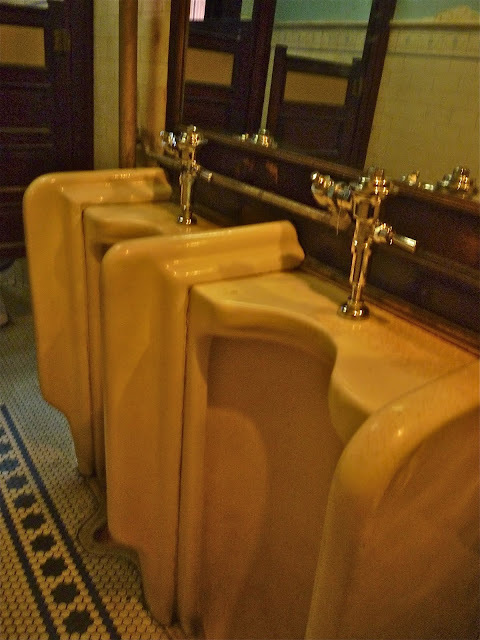 Every bit of the room, from the stall doors to the ceramic floors to the stained glass ceiling, has the look of the early 20th century. It's perfect. Oh, and if you think my waxing rhapsodic about urinals is odd, consider this: just outside the men's room door is a framed proclamation from the Mayor honoring the 100th year anniversary, in 2010, or the urinals. Pauline's Cabaret, one of the more curiously titled taverns in Gotham, shivers under the elevated on Broadway in the Knightsbridge section of The Bronx. 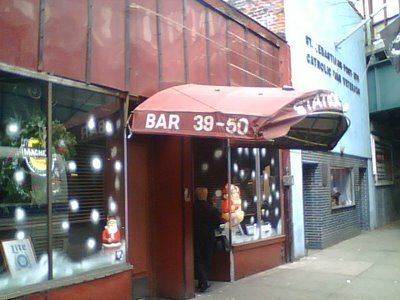 The bar is run by the O'Sullivans, Pauline and her son Roger. Hence, the name. 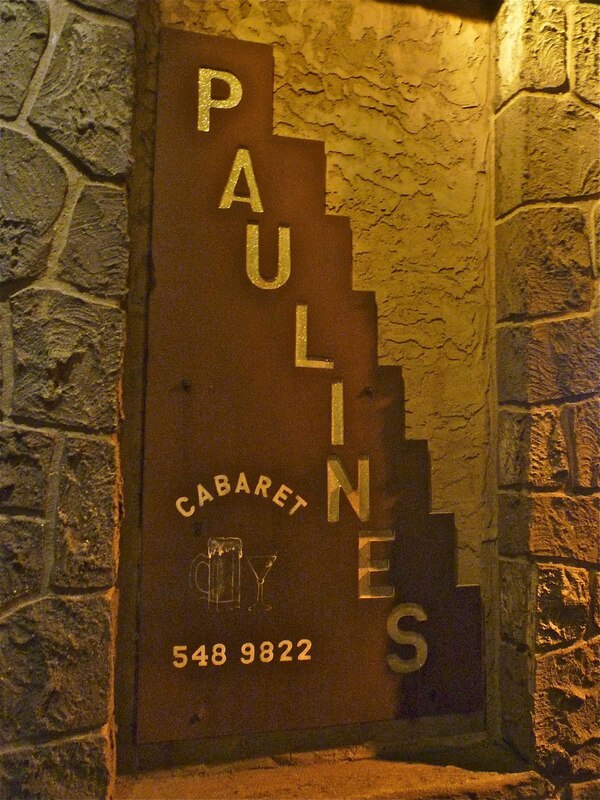 Sure, there's karaoke, but that's recent, and can't completely explain the "cabaret" part of the moniker. Maybe there's entertainment on certain evenings. Not sure about the strange, stairstep sign. Kinda looks newish, but the phone number without a prefix if definitely old school. 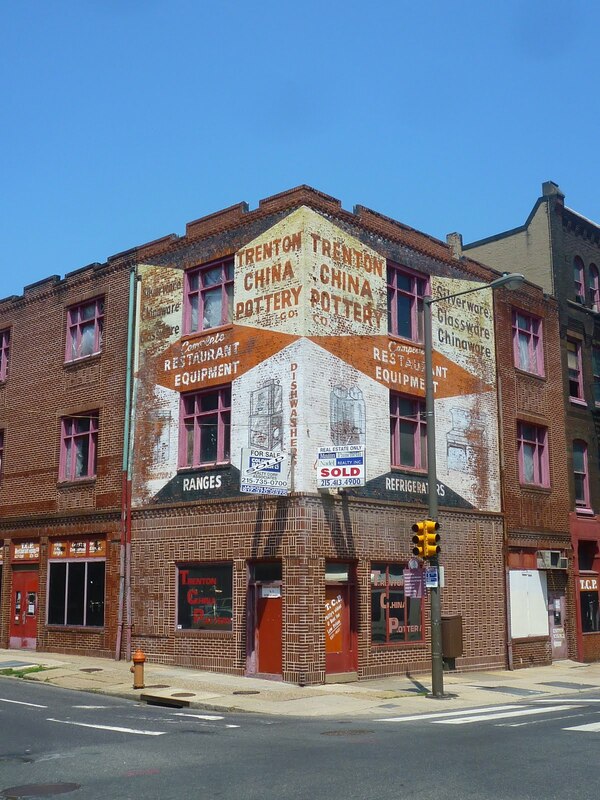 Trenton China Pottery is a restaurant supply business situated at the Philadelphia corner of 2nd and Arch Streets in the Old City section of the town. The company began in 1927 and was founded in this building, which is wallpapered with its multi-colored painted advertising and illustrations of appliances. Those ads are now in a wonderfully faded condition. Last April, a group of undisclosed local investors bought the buildings for $1.4 million and plans to convert the nine buildings that comprise the structure. The plan is to have residential units on the top floors and retail at street level. I find it unlikely that they're keep the ads, not with new retailers moving in. That would be a crying shame. The company is now located on Memphis Street in Port Richmond and operates under the new name; Trenton China. Stumbled upon this cute little business in Riverdale. It specializes in all the things we supposedly don't do anymore—like get our radios, vaccum cleaners and televisions repaired. 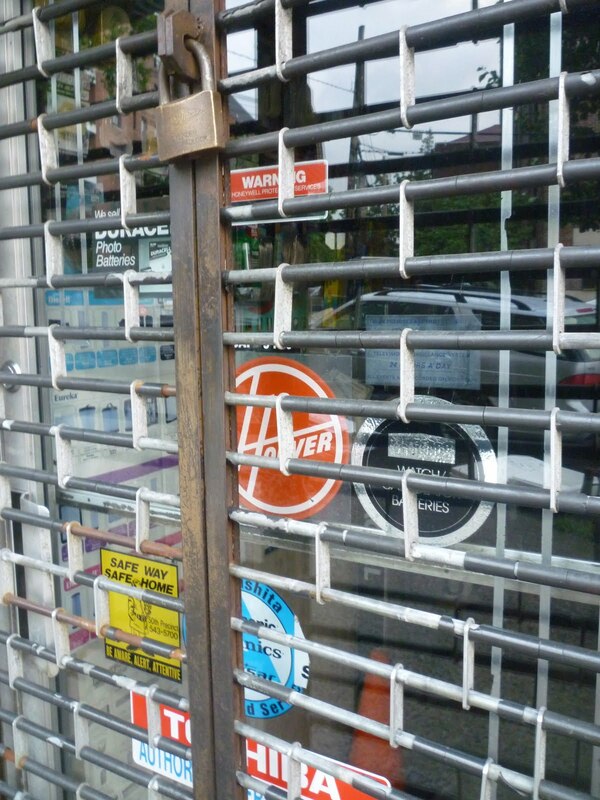 On the door are stickers advertising all the brands they are authorized to repair, including good old Hoover. Never heard this particular slogan for Bazzini, the age-old New Yokr nut company. But maybe I just wasn't paying attention. A descendent of the Cafiero family has once again been in touch with me. The result is the above photo, the first color image I have ever seen of Cafiero's, the once-famed South Brooklyn Italian eatery. 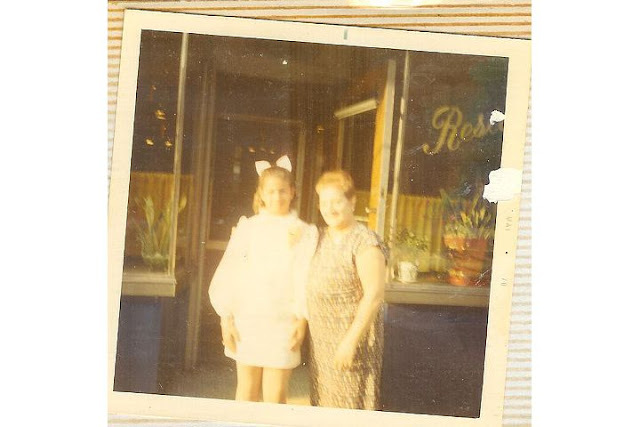 The image is from 1970, just a few years before owner Sharkey Cafiero closed the legendary gathering place for good. I'm sure if the picture was a wider shot, we would see on either side of the business a rather down-on-its-luck neighborhood. In the picture are Kate Cafiero, Sharkey's wife, and one of her nieces. (The niece's sister sent me the photo.) The picture confirmed that the blue frontage, which is still visible on the building, was original. We can also see small demi-curtains inside of a kind that were common to restaurants in the first half of the 20th century. You know those ridiculously bad illustrations that some old school barbers and dry cleaners have in their windows, the 1970s-style, everybody-has-feathered-blown-dried-hair pictures that illustrate various cuts, and cleaning and tailoring opportunities? Well, David's Barber Shop on the Upper East Side has one as its permanent sign! Is it me, or does the man look even prettier than the girl? A reader forwarded me this image. It's one of the damnedest pieces of signage I've ever encountered. A leather-jacketed tough, 1950s-style, biding his time leaning against a brick wall, standing on top of a...big yellow clock. WTF? The clock—which has no hands and hasn't worked in years—obviously has nothing to do with the current tenants of the building, an Assemblywoman and some lawyers. The greaser is chained to the wall and a bit weatherbeaten. Any Howard Beachers out there who know the story? In Knickerbocker Avenue in Bushwick. Circo's has been around since 1945. Nice neon. Photo credit goes to my wife, who can't get enough of Bushwick. I, personally, can. 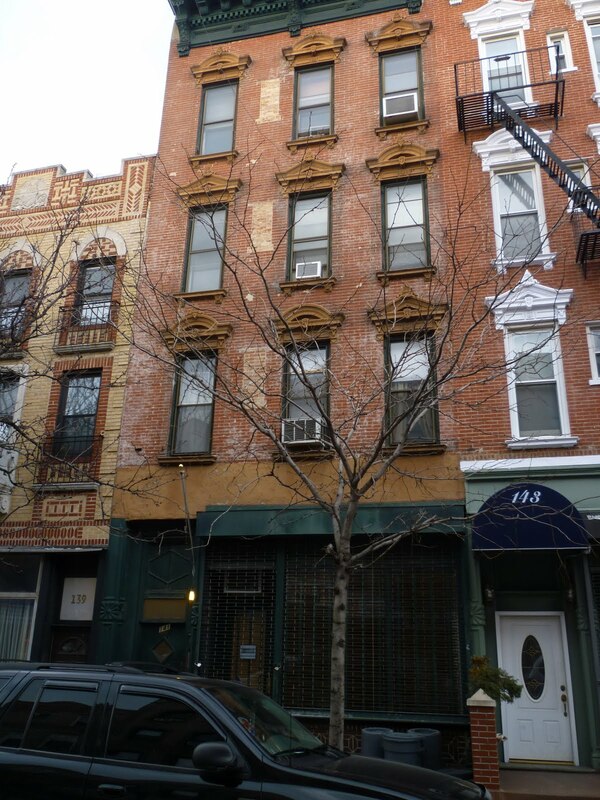 This is the ninth post of "The Union Street Project," in which I unearth the history of every building along the once bustling Brooklyn commercial strips of Union Street between Hicks and Van Brunt, and Columbia Street between Sackett and Carroll. The buildings 141, 143 and 145 Union Street were built as a block. Aside from various modern paint jobs, and certain filled-in windows, they are near-identical. They stand out on the block for a number of reasons. They are four stories tall on a block of three-story buildings. The lintels are very decorative, and the cornices are intact. I have not been able to discover the name of the builder of the three structures, but he's to be applauded. The westernmost building is 141 Union Street. All three building once had stores on their ground floors, though only one has a working business today. In the 1920, 141 Union was the home to a lovely looking pastry shop, as you can see from the Municipal Archives photo below. R. Bottaro Pasticceria was the name of the place. I have not been able to learn anything more about the shop. 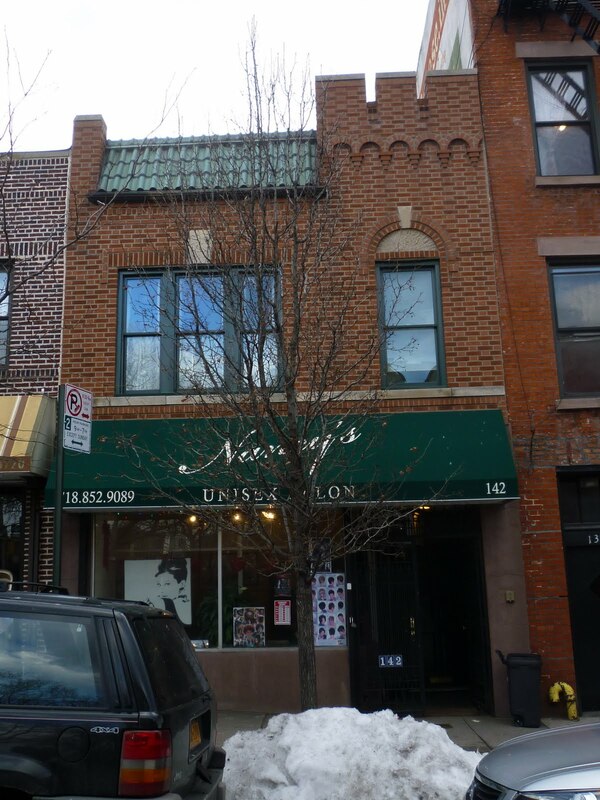 I also learned that 141 Union was a boarding house around the turn of the 20th century. And a boarding house quite well known to the police it was! In 1888, a man named Robert Morris, who lived here, charged his wife with being a "habitual drunkard" who had not been sober in three months time. She was sent to the "Inebriates Home." This same Robert Morris, a tailor who seems to have had a hard life, was accused of stealing a coat in 1886. The charge was dismissed, as the owner of the coat had refused to pay for the repair work Morris had done. In 1897, John Drummond, who resided here, was almost killed by Palo Bartolo. Bartolo was arrested. Meanwhile, a nice Swedish girl, newly landed and living here, was looking for housework in 1889. I wonder if she knew the Morrises. While we're on a Yorkville nostalgia spree, let's post this picture. It's from a site that lists the names and addresses of many of the old Yorkville businesses. According to the site, the pizzeria was on E. 86th Street. A man named Tony made the pizzas. Aside from the great name, and great slogan ("Pizza With That Real Italian Taste"), note the newsstand out front, what looks like a shoeshine stand, and the price! 25 cents a slice.